The magazine was spotted in the wild yesterday, in Fort Collins, Colorado, though no sign yet here in Brooklyn, NY. Still, it’s time to get the corrections in. 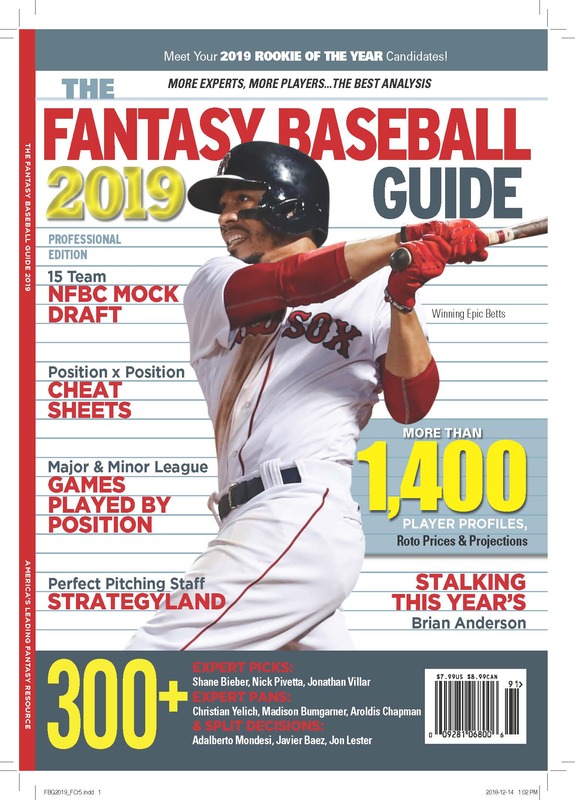 If you’re looking for the online version, head over to thefantasysportsguide.com. Use the promo code ROTOMAN18 and save a buck. 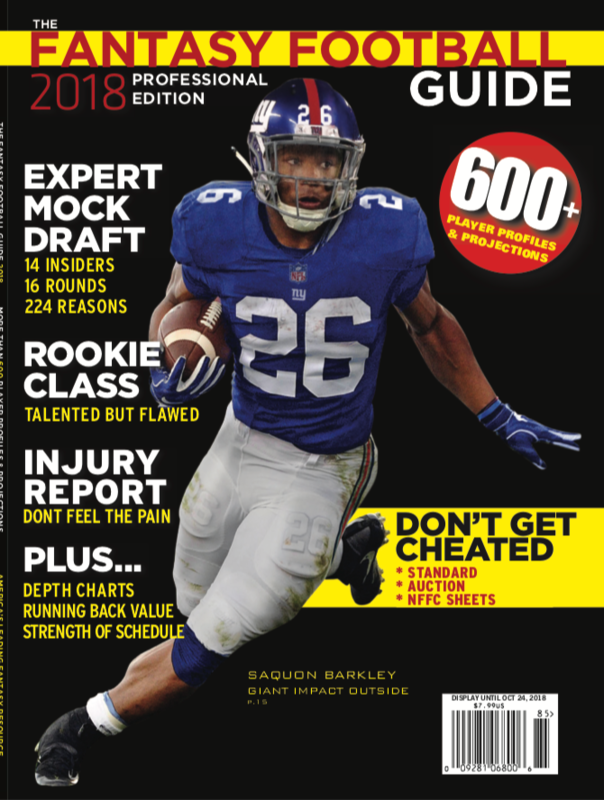 We appear to be the only fantasy football magazine with Saquon Barkley on the cover. Is that a virtue? First order of business. Zach Greubel, who wrote some team profiles, sent in his Writers Survey answers and I didn’t see it.. So his answer aren’t in the magazine. But they are here. Zach hails from Cheyenne, Wyoming — home of Miami Heat forward James Johnson and New York Mets outfielder Brandon Nimmo. He enjoys soft-serve ice cream, Lord of the Rings and vacationing in Vail, CO. He does not enjoy kale, mushrooms or lofty heights. Zach is a life-long Broncos fan, writes for Gridiron Experts and has been a contributing expert to FantasyPros.com since 2012. You can criticize, agree with or encourage him on Twitter: @ZachGreubel. Most Valuable PlayerAaron Rodgers – When healthy, he’s perennially a top MVP candidate. It’s been four years since he won his last MVP award; he’s due for another one after a shortened season due to a broken collarbone. Saquon Barkley – It’s a deep running back class, but unless he succumbs to injury then Barkley is the odds-on favorite for ROY honors. Ezekiel Elliott – The Cowboys will need to utilize Elliott as much as they did in his rookie year of 2016, if not more. A 2,000-yard campaign isn’t out of the question. Cameron Jordan – He tallied a career-high 13 sacks a year ago, has more help on the defensive line and a talented defense behind him. Stephen Gostkowski – The Patriots are always near the top of the league in scoring and Gostkowski is their top scorer. Randall Cobb – Jordy Nelson is gone and Cobb will inherit his fair share of targets. Injuries over the past two years are scaring people away, but he’s a huge PPR bargain as his current ADP stands. Brandin Cooks – I’m not sure about “most” overrated, but there are a lot of mouths to feed in Los Angeles. Cooks is widely viewed as a WR2 when he should be drafted as a WR3. Sammy Watkins is in the same boat. Lamar Jackson – Joe Flacco has underwhelmed long enough. Jackson can breathe new life into Baltimore’s stagnant offense. Saquon Barkley – Barkley will be featured immediately in the Giants’ backfield and has the easiest path to success of any rookie running back. D.J. Moore – Moore is arguably the most athletic receiver in this year’s class and will start right away opposite Devin Funchess. Hayden Hurst – Mike Gesicki is perhaps the most athletically gifted tight end in the history of the sport, but Hurst seems to be a better fit at the professional level. Daniel Carlson – Assuming Carlons can beat out Kai Forbath, he’ll be the starting kicker on one of the best offenses in the NFL. Tremaine Edmunds – The Bills defense figures to be on the field plenty in 2018. Edmunds is an athletic freak who has already taken command of the huddle. In the Injury Report, the wide receiver Mike Williams is the first player in the Tight End section. He should be the last player in the Wide Receiver section. In the Running Back position pages, Joe Mixon incorrectly is given the birthday of the person listed before him, instead of the correct one, which is: July 24, 1996.